Starting in Mission Bay we summit atop Mt Soledad and return to Mission Bay. 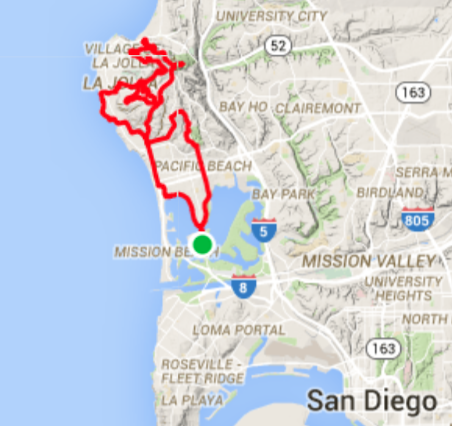 We ride through Pacific Beach, Bird Rock, and La Jolla all while going partially up and then back down the mountain in an encircling pattern. We repeat the up down pattern three separate times and encircle ¾ of the mountain before our final and fourth ascent to the top. At the top we’re treated to a fantastic panoramic view of all of San Diego and beyond. Our final treat is a thrilling descent with a beautiful view all the way back to Mission Bay. Our ride up and over Mt.Soledad was wonderful. The climbs were a challenge, but the view at the top made them well worth it. Tony's leadership made for an informative and fun day. 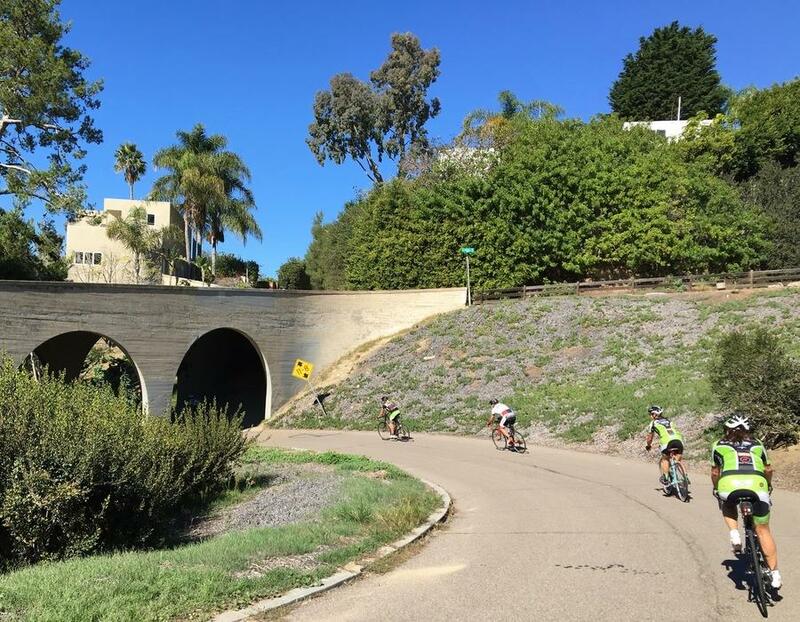 We stopped by the Farmer's Market in La Jolla for a quick bite, visited the famous Wind-n-Sea Shack, and rode over and under the little known "Bridges of La Jolla". 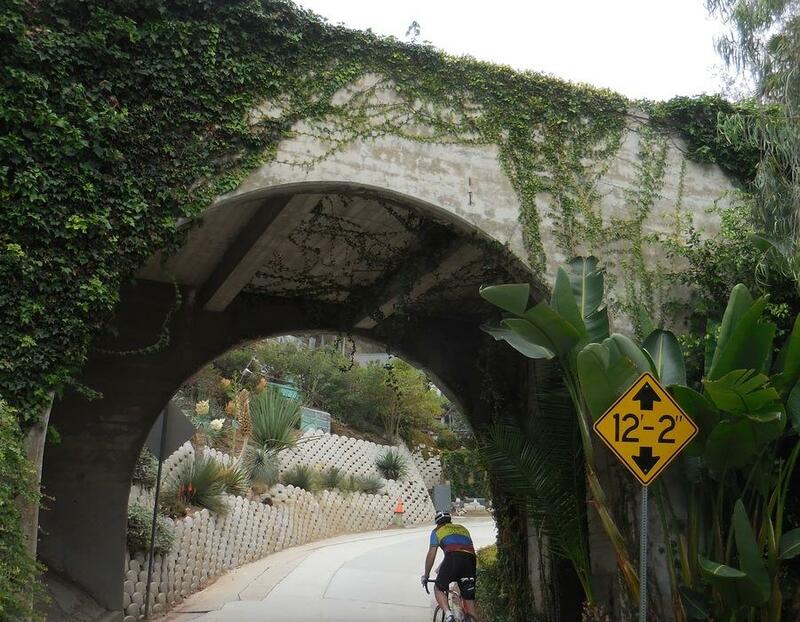 Tony lead us through some of the most beautiful, old neighborhoods of La Jolla, far from the hustle and bustle of downtown. We ended our day with a delicious lunch sitting on the shore of Mission Bay. 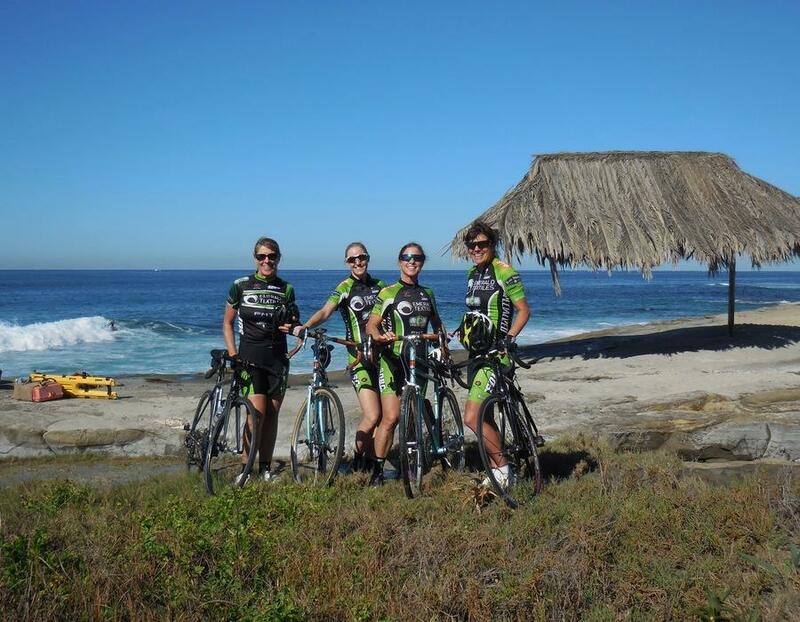 I would highly recommend this ride to cyclist with some riding experience and strongly recommend it to anyone who would like to see a slice of La Jolla few others have a chance to see. Thanks Tony! This is our most demanding and rewarding tour. Mt Soledad’s magic is its geography. At an elevation of 822 feet and a brief 1.2 miles from the Pacific ocean it's ideally located as a natural overlook to one of California’s most beautiful coastlines. The route progression is best described as a serpentine encirclement of views and vistas. The first neighborhood we see is Mission Bay a wonderland of outdoor activities followed by Pacific Beach our beach cruiser capital. After our first climb and descent we reach Bird Rock’s “hidden” coastline and La Jolla the “Jewel” of San Diego a vibrant community rich in hospitality and eager to share with its many visitors. Leaving downtown La Jolla, Mt Soledad awaits us with the Pacific coastline as a backdrop. 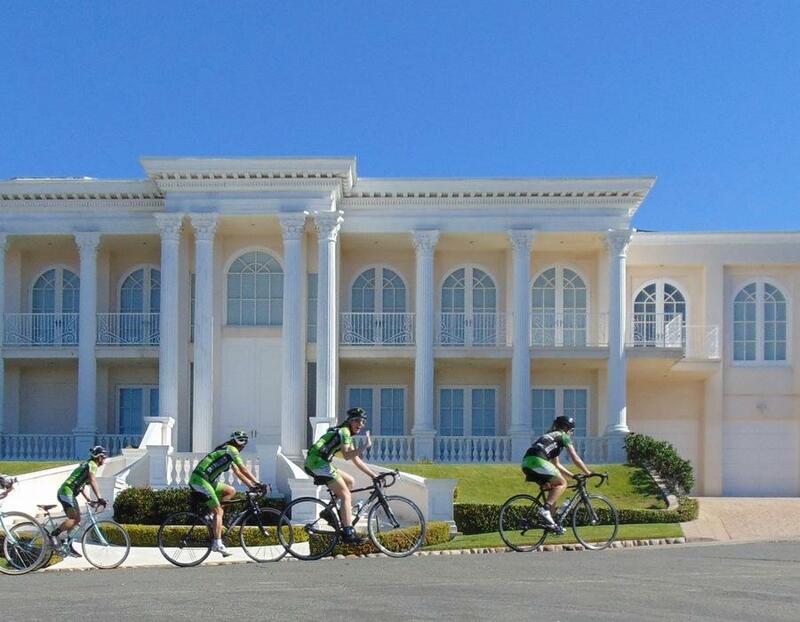 Here we’ll ride part way up and down twice viewing magnificent homes and meticulous landscapes rivaled only by beautiful ocean and coastal views from every angle and altitude. At the top is a city park with a panoramic view of all of San Diego and, on a clear day, nearby Mexico and the mountains of Los Angeles are visible. At the center of the park is the Mt Soledad Veterans Memorial with its towering cross. With climbing behind us and the descent in front we return to Mission Bay enjoying one of my all time favorite views of our city and its golden coast. A view well worth pausing for I'm sure you'll agree. Our least accessible tour, Mt Soledad’s views are nothing short of spectacular, but more than the beautiful views will take your breath away. The climbing: very little of this ride is without some degree of climb or descent. Someone considering this ride should be prepared for this. Most, but not all of the roads are in good condition, we ride on all paved roads along with auto traffic and one short bike path. Several turns, riding with traffic and steep gradients make this a technically challenging route. Our approach, however, is not to conquer the mountain, but to tour the neighborhoods and vistas that have been secreted away from the casual observer. This being our hardest per-mile ride, it is for very fit individuals and experienced cyclists who enjoy the reward of climbing and are comfortable with descending. 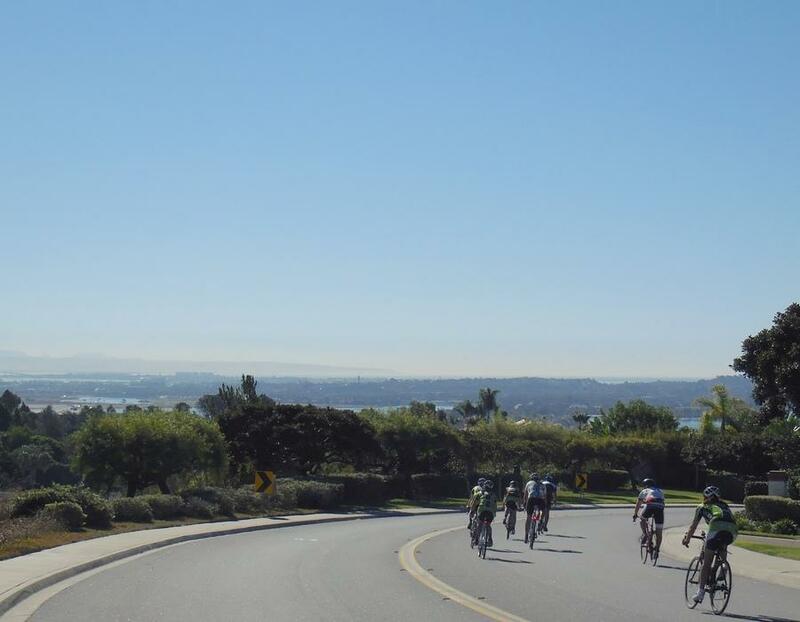 The route has a lot of climbing and descending that provide beautiful views of Mission Bay, Pacific Beach, Bird Rock, La Jolla, Mount Soledad, culminating with a panoramic view of the city and our coastline from the Mount Soledad Veterans Memorial. The start time for this ride can be flexible but it works best if started before noon. We can stop in Bird Rock or La Jolla for coffee and something to eat if desirable. We will stop along the the route for water and restrooms as needed. Variations to the route are possible to shorten the ride if needed. *Cycling undershorts are available for $20.00.